CarGurus has 7,921 nationwide Yaris listings starting at $1,977. Yeah, it’s sort of small, and yeah, it’s not going to blow anything away at a green light, but Toyota’s 2014 Yaris subcompact hatchback offers a pleasing blend of versatility, comfort and value that belies its once-bedraggled image. After a comprehensive rework in 2012, this little liftback has gained a reputation for reliability, looks and safety that has the competition sitting up and taking notice, while owners benefit from a bit more rear-seat space, some added cargo area and a higher driver’s seating position for almost SUV-like visibility. 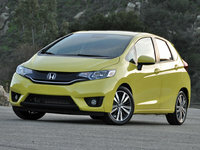 Again available in 3 trims, the base L, the midlevel LE and the sporty SE, this pint-size hatchback can be delivered in either a 3-door or 5-door version in its L and LE configurations, with folding rear seatbacks adding immeasurably to its stated 15.3 cubic feet of cargo room to said rear seatbacks. The SE trim, meantime, remains available only in 4-door garb and flaunts 15.6 cubic feet of cargo room to the rear seatbacks. The SE additionally boasts a sport-tuned suspension that gives this already maneuverable commuter car a distinct extra kick on winding back roads. Powering each Yaris again this year is the ubiquitous 1.5-liter inline 4-cylinder (I4) engine that remains under the management of a standard 5-speed manual transmission in the L trim (optional in the SE). The LE and SE, meanwhile, are delivered with a 4-speed automatic transmission that’s described by most reviewers as outmoded and wasteful, fuel-wise. The L can, of course, get the 4-speed automatic as an option. In any case, no matter the transmission, the I4 pumps out a comparatively tepid 106 hp and 103 lb-ft of torque. Mileage, however, is a splendid 30 mpg city/37 highway in stick-shift-equipped Yaris trims, with the automatic-equipped trims stuck at a could-be-better 30/36 clip. In maintainming tradition, meanwhile, this little hatchback is delivered only with front-wheel drive (FWD). Keeping options to a minimum means, in the eyes of some beholders, a decent number of standard features thrown even into the base Yaris L. That may, however, be debatable, as this entry-level trim boasts only such rather bland standard bling as 15-inch steel wheels, cloth upholstery, power door locks, tilt-wheel steering, air conditioning, some unconvincing simulated alloy cabin accents, a folding rear seatback and a single-CD player with 6 speakers. The inclusion of standard Bluetooth hands-free communications, though a nice touch, still leaves this entry-level Yaris trim short of Ford’s Fiesta S, for example, features-wise. Anyhow, moving up to the 2-door LE trim, expect to find all the L’s features, plus a height-adjustable driver’s seat, cruise control, split-folding rear seatbacks, remote keyless entry, power windows, power-adjustable outside mirrors and cruise control. The flagship SE, meanwhile, flaunts many of the above goodies, as well as a sportier suspension setup, 16-inch alloy wheels, a rear spoiler, premium cloth upholstery and upgraded cabin accents, including a leather and simulated alloy steering wheel and leather-wrapped shift knob. Accessories (there are really no true options) with this tiny Toyota are limited to carpeted floor and cargo mats, exterior paint protection film, mudguards, a first aid kit and a roadside emergency kit. Finally, notable standard safety features aboard all 2014 Yaris trims include 4-wheel antilock brakes (ABS), traction and stability control, front side-mounted airbags, front head restraint whiplash protection, and front and rear head airbags, with the top-shelf SE again sporting standard front fog/driving lights, as well. 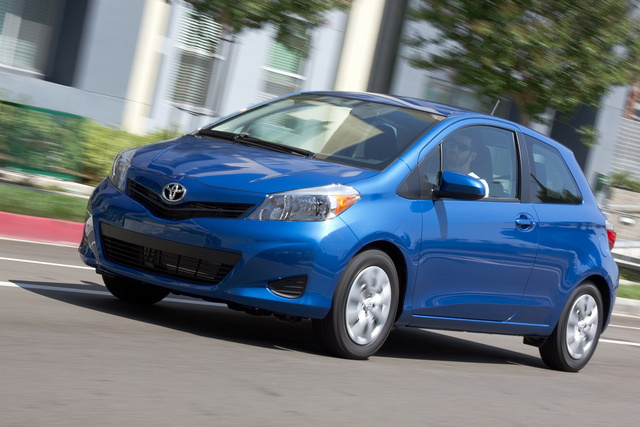 What's your take on the 2014 Toyota Yaris? 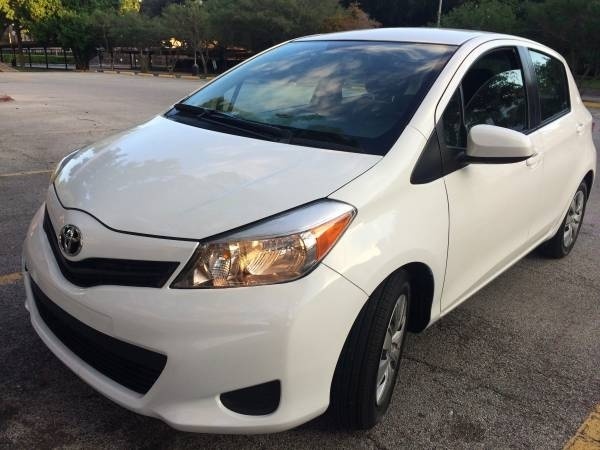 Have you driven a 2014 Toyota Yaris?